synonym　Philadelphus satsumanus Siebold ex Miq. 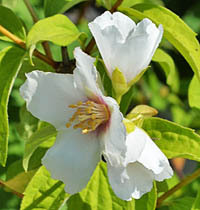 synonym　Philadelphus laxus Schrad. ex DC. synonym　Philadelphus coronarius auct. 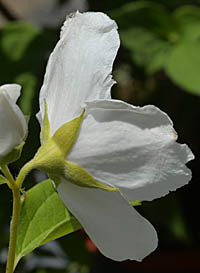 non L.
synonym　Philadelphus coronarius L. var. satsumi (Siebold ex Lindl. et Paxton) Maxim. 13-5 Philadelphus x insignis Carr. Name first published in; Bean, W.J. (1976) Trees and Shrubs Hardy in the British Isles, vol 4, p. 145. 【Basionym】 Philadelphus x purpureo-maculatus (Lemoine) Rehder. 【標準品種】 Philadelphus ‘Purpureo-maculatus’ (standard specimen: Leonard A. Springer 12610, conserved at WAG). Cultivars: ‘Beauclerk’, ‘Belle Etoile’[ベルエトワール] , ‘Bicolore’, ‘Burkwoodii’, ‘Galathee’, ‘Nuage Rose’, ‘Oeil de Pourpre’, ‘Purpureo-maculatus’ , ‘Sybille’. Name first published in: Bean, W.J. (1976) Trees and Shrubs Hardy in the British Isles, vol 4, p. 141. 【Basionym】Philadelphus. x lemoinei (Lemoine) Rehder. Description: plants 0-2-2 m high. 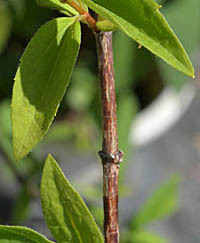 Leaves on the flowering shoots always and on the non-flowering shoots usually less than 5 cm long. Flowers single or (semi-)double, completely (creamy-)white. 【標準品種】Philadelphus ‘Lemoinei’(standard specimen: Gert Fortgens GF 200, conserved at WAG). 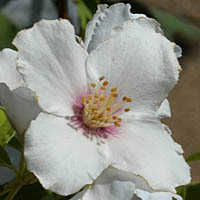 Cultivars: ‘Avalanche’, ‘Dame Blanche’, ‘Erectus’, Fimbriatus’, ’Frosty Morn’, ‘Lemoinei’, ‘Manteau d’Hermine’(d), ‘Mont Blanc’, ‘Pavilion Blanc’, ‘Silberregen’, ‘Snowdwarf, ‘Snowgoose’ and ‘Velleda’. Name first published in; Bean, W.J. (1976) and Trees and Shrubs Hardy in the British Isles, vol 4, p. 146. ‘Schneesturm’, ‘Snowbelle’, ‘Virginal’, ‘Yellow Hill’ and ‘Zhemczug’. 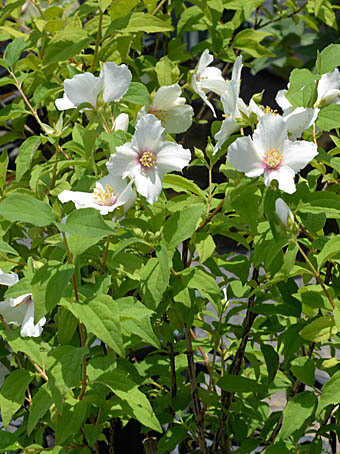 4)Cultivar classification of Philadelphus L.